Select the correct conjunction to complete the sentence. 1. Don't eat (CONJUNCTIONS CARD 3) talking on the phone. 2. Just go straight (CONJUNCTIONS CARD 4) you reach the station. 3. (CONJUNCTIONS CARD 3) she is a genius, she is not a good person. 4. I will finish this work (CONJUNCTIONS CARD 10) you come. 5. Put you coat on, (CONJUNCTIONS CARD 1) you'll catch cold. 6. 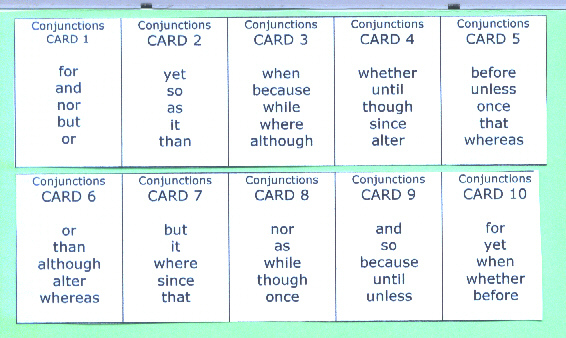 (CONJUNCTIONS CARD 5) you have started your homework it's better to keep doing it (CONJUNCTIONS CARD 9) you finish. 7. (CONJUNCTIONS CARD 6) my sister is talkative, I am quiet. 8. We are not sure (CONJUNCTIONS CARD 7) she is right. 9. The baseball game will be held (CONJUNCTIONS CARD 9) it rains. 10. Even (CONJUNCTIONS CARD 8) he is the boss, I have to disagree with him. 11. I speak neither Chinese (CONJUNCTION CARD 1) French. 12. You should stop smoking (CONJUNCTION CARD 8) the doctor said. 13. (CONJUNCTION CARD 4) she started working, we haven't had time to meet. 14. (CONJUNCTION CARD 5) you meet him, you will never forget him. 15. I am not sure (CONJUNCTION CARD 10) he is coming or not. 16. Please be on time, (CONJUNCTION CARD 6) you will miss the bus. 17. We should change the schedule, (CONJUNCTION CARD 9) you are available. 18. Please make sure (CONJUNCTION CARD 5) your cell phone is off, (CONJUNCTION CARD 10) you start the exam. 19. (CONJUNCTION CARD 3) this movie was recommended, I haven't seen it (CONJUNCTION CARD 10). 20. (CONJUNCTION CARD 2) it was getting lighter outside, we saw what it was.